THE SCARS IN PNEUMA (“The Scars in the Soul” – from “πνεύμα”, ancient Greek word for “breath”, “breath of life” and, in a religious context, for “spirit”, “soul”) is an Epic/Melodic Black Metal act based in Brescia, Italy. Initially born as a solo project of singer/guitarist Lorenzo Marchello in the sorrowful month of December 2016, and it turned to a band when trusted musicians Francesco Lupi (guitars) and Daniele Valseriati (drums) joined the ranks during the year 2017. Musically, they provides their own particular Extreme Metal style, which can be defined as a mix of Black Metal, melodic riffing and epic passages, with a touch of Doom. Lyrically, it’s all about themes such as living with your own demons, the regrets we have in life, the time passing by, and the beloved people we have lost. 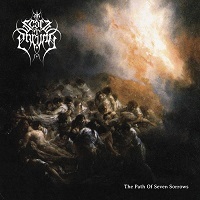 “The Path of Seven Sorrows” is their debut LP, and contains seven tracks. “Devotion” opens with some dissonant guitar chords that lead to a fueled charge of Black Metal with some melody, mostly in the twin guitar work. The main riff is a bit MAIDEN-esque…”Killers” era. “Souls are Burning” opens with a tight attack, from guitars and drums in unison. The vocals are hushed a bit, not overly shrieking. It allows the music to take center stage. Still, the song doesn’t venture out a whole lot, holding darkness as its main tenant. A calming female voice followed by clean guitar notes take the interlude. “Spark to Fire to Sun” hears some of that Doom influence come into play. It has a solemn sound, and you can feel the life slowly draining from you. The melodies are subdued but I wouldn’t have it any other way…it works. “All the Secrets that we Keep” opens with a slow, laboring rhythm and despondence is high. It takes a right turn with lead guitar and gathers some steam, as the drums hammer away relentlessly. “Dark Horizons Ahead” is a shorter track, clocking in at only three minutes in length. It has a bossy sound from the rhythm of the guitars, as if to say, we rule the world. “The Glorious Empire of Sand” is the beast on the album, clocking in at over eight minutes. Melancholy clean guitars open the album, like a soft sunrise on a cold winter’s morning, with an air of hope perhaps. The main riff roars in with a bit of INSOMNIUM for me, but darker. There is an energy bubbling under the surface here…a beast that waits with purpose. “Constellations” closes the album with clean guitars and vocals…a longing can be felt from deep within. It puts a sweet ending to a stoic album. Overall, the themes that they discuss are well reflected in the music…loss, despair, and living with your own demons. The entirely of the album casts a shadow of gloom upon you. But, the melodic guitar parts add another dimension. The vocals have just the right amount of sound as well, and do not take over the album with a constant, annoying shriek. Well done guys.